The 2704CP is a fully programmable controller suitable for precision control of temperature, carbon potential, dewpoint and oxygen in atmosphere heat treatment applications. It is capable of being used solely to control the carbon potential, dewpoint or oxygen in a furnace, or as an integrated furnace controller where any of these variables are controlled in conjunction with temperature. Additional features provide maths and combined logic functions. At the heart of the controller is a specially designed function block capable of accepting most zirconia probes. Standard features include an automatic probe cleaning routine, a sooting alarm and diagnostics indicating that the probe is about to fail and should be replaced. For standard applications, controllers are shipped pre-configured to the users specification, using a simple to complete order code. User customisation can be achieved by reconfiguring the controller via its front panel interface or Eurotherm's iTools configuration software. The 2704CP is fully compatible with the standard 2704 process controller which is capable of up to three PID control loops; data sheet number HA026669. Trending enables the user to view, both current and historical information on the process on the process variable and setpoint of each control loop. The 2704 user interface offers the user an extremely easy method of editing, selecting and running programs and all programs can be given a meaningful name. Its programmer functions are very advanced and can be easily interfaced to remote instruments including specialized Mass Flow controllers. Program editing can be achieved using a PC running the iTools Setpoint Program Editor. The 2704CP can interface directly to most commonly available zirconia probes including Barber Colman, Drayton, SSI and Marathon. The zirconia probe input can be configured to measure carbon potential, dewpoint or oxygen making the 2704CP ideal for applications such as carburizing furnaces and endothermic generators. An automatic probe cleaning routine is available where either by a digital event or on a timed basis, an output is energized to perform a probe “burn off”. While the burn off is in progress and during a timed recovery period the measured PV is frozen so that closed loop control can continue. Other control options during cleaning can be configured. Diagnostic facilities are also included. A sooting alarm indicates that potentially soot is about to be deposited in the furnace. Continuous measurement of probe impedance and automatic monitoring of the probe recovery from cleaning ensures optimum furnace operation. A 2604CP is also available. Its display incorporates a 2 line 5 digit display for display of setpoint and process value, plus an LCD text panel that the operator uses for entry of program data and other parameters. The 2604CP is functionally capable of performing the same control strategy as the 2704CP. However, the customizable display of the 2704CP significantly simplifies the user interface for the operator. In combination with the 2500DIN rail controller, a very powerful and low cost vacuum furnace system can be implemented. The 2704CP acts as the master temperature/carbon programmer and user interface for the 2500. A typical use of the 2500 could be to implement additional control loops such as quench oil and control the logic and timing functions of the furnace. 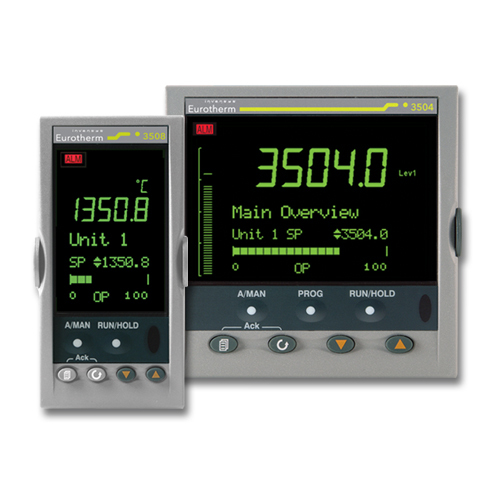 The 2500 can measure up to 32 thermocouple inputs, fully isolated to 250Vac potential. A strategy within the 2500 can monitor all thermocouples to detect the minimum value, which can then be sent via digital or analogue communications to the 2704CP to be used as a wait condition, ensuring temperature uniformity within the furnace and provide a guaranteed soak.